"Many people are familiar with the coral reefs that thrive in shallow, well lighted, clear tropical waters where myriad colorful hard and soft corals provide habitat "infrastructure" for numerous invertebrates and fishes. The corals provide protection and cover, sources of nutrition, and sites for reproduction. Corals, however, also grow in the deep, cold sea. Although the existence of some of these deep-sea coral thickets has been known for several centuries, initially from pieces of broken corals brought up with fishing gear, scientists know little about their distribution, biology, behavior, and function as essential habitats for fishes and invertebrates. Some deep-water corals (also called cold-water corals) do not form reefs exactly like those in tropical waters. Often, they form colonial aggregations called patches, mounds, banks, bioherms, massifs, thickets or groves. These aggregations are often still referred to as “reefs.” While there are nearly as many species of deep–water corals as there are shallow-water species, only a few deep-water species develop “reefs.” Deep-water corals also provide crucial habitat and reproductive grounds for commercially important fisheries including sea bass, snapper, porgy, rock shrimp and calico shrimp, thus drawing the commercial fishing industry to these fragile areas. Human activities constitute the most serious threat to these fragile corals. Destructive bottom fishing, as well as oil and gas exploration and exploitation have the potential to destroy large areas of coral habitat in a relatively short time. These activities create coral rubble, which is not a suitable habitat for fishes and invertebrates. In recent years, scientists have begun to study deep-water corals more closely, and some countries with deep-water corals in their territorial waters have begun to implement fishing restrictions in sensitive coral areas. Three main groups of corals make up deep-water coral communities: hard (stony) corals of the Order Scleractinia, which form hard, ahermatypic reefs; black and horny corals of the Order Antipatharia; and soft corals of the order Alcyonacea, which includes the gorgonians (sea fans) (Williams, 2001). Deep-water corals are similar in some ways to the more familiar corals of shallow, tropical seas. Like their tropical equivalents, the hard corals develop sizeable reef structures that host rich and varied invertebrate and fish fauna. However, unlike their tropical cousins, which are typically found in waters above 70m depth and at temperatures between 23° and 29° C, deep-water corals live at depths just beneath the surface to the abyss (2000 m), where water temperatures may be as cold as 4° C and utter darkness prevails. At these depths, corals lack zooxanthellae. These symbiotic algae provide food for many shallow-water corals through photosynthesis. They also assist in the formation of the calcareous skeleton, and give most tropical corals their coloration. By contrast, the polyps of deep-water corals appear to be suspension feeders. They capture and consume organic detritus and plankton that are transported by strong, deep-sea currents. These corals are commonly found along bathymetric highs such as seamounts, ridges, pinnacles and mounds (Southampton Oceanography Centre). Deep-water corals range in size from small solitary colonies to large, branching tree-like structures, which appear as oases of teeming life surrounded by more barren bathymetry. The gorgonians (sea fans) also range from small individuals to those with tree-like dimensions. The gorgonian, Paragorgia arborea, may grow in excess of three meters in length (Watling, 2001). Growth rates of branching deep-water coral species, such as Lophelia and Oculina, range from ~ 1.0 - 2.5 cm/yr, whereas branching shallow-water corals, such as Acropora, may exceed 10-20 cm/yr. Using coral age-dating methods, scientists have estimated that some living deep-water corals date back at least 10,000 years (Mayer, 2001). However, little is known of their basic biology, including how they feed or their methods and timing of reproduction. Deep-water corals are found globally, from coastal Antarctica to the Arctic Circle. In northern Atlantic waters, the principal coral species that contribute to reef formation are Lophelia pertusa, Oculina varicosa, Madrepora oculata, Desmophyllum cristagalli, Enallopsammia rostrata, Solenosmilia variabilis, and Goniocorella dumosa. 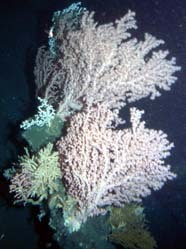 Four of those genera (Lophelia, Desmophyllum, Solenosmilia, and Goniocorella) constitute the majority of known deep-water coral banks at depths of 400 to 700 m (Cairns and Stanley, 1982). Madrepora oculata occurs as deep as 2,020 m and is one of a dozen species that occur globally and in all oceans, including the Subantarctic (Cairns, 1982). Colonies of Enallopsammia contribute to the framework of deep-water coral banks found at depths of 600 to 800 m in the Straits of Florida (Cairns and Stanley, 1982). Two of the more significant deep-sea coral species are Lophelia pertusa and Oculina varicosa. These species form extensive deep-water communities that attract commercially important species of fishes, making them susceptible to destructive bottom trawling practices (Reed, 2002a). Increased sedimentation places additional stress on corals. Oil and gas exploration structures and activities, particularly in the North Sea and adjacent areas, also damage Lophelia communities. Subsequent oil and gas production activities may also introduce noxious substances into these areas. 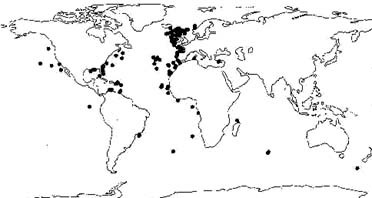 Global distribution of Lophelia pertusa. Image: Southampton Oceanography Centre, UK. Lophelia pertusa is the most common aggregate-forming deep-water coral. Typically, it is found at depths between 200 and 1,000 m in the northeast Atlantic, the Mediterranean Sea, along the mid-Atlantic Ridge, the West African and Brazilian coasts, and along the eastern shores of North America (e.g., Nova Scotia, Blake Plateau, Florida Straits, Gulf of Mexico) as well as in parts of the Indian and Pacific Oceans. Like tropical coral reefs, Lophelia communities support diverse marine life, such as sponges, polychaete worms, mollusks, crustaceans, brittle stars, starfish, sea urchins, bryozoans, sea spiders, fishes, and many other vertebrate and invertebrate species. Lophelia has been found most frequently on the northern European continental shelves between 200 and 1000 m, where temperatures range from 4° to 12°C, but it has also been found at depths greater than 2,000 m. Once a colonial patch is established, it can spread over a broad area by growing on dead and broken pieces of coral (coral rubble). Lophelia has a linear extension of the polyps of about 10 mm per year. The reef structure has been estimated to grow about 1 mm per year (Fossa, 2002). Scientists have also found Lophelia colonies on oil installations in the North Sea (Bell and Smith, 1999). Lophelia pertusa can occur in a variety of structures and forms. DNA-based sequencing tests conducted at the University of Southampton Oceanography Centre, UK, have indicated that different morphological varieties of Lophelia all belong to the same species (Rogers et al., on-line).